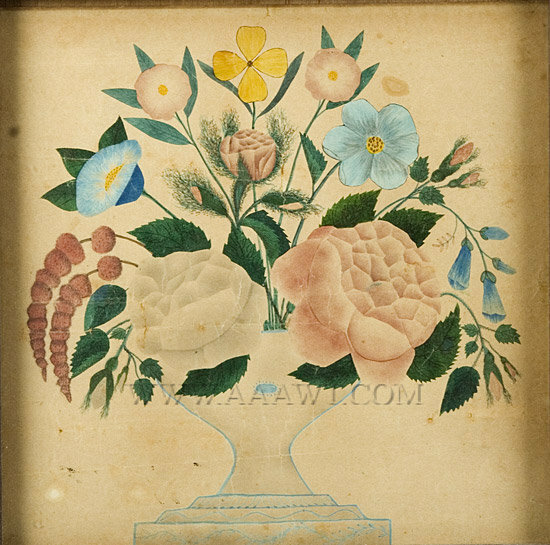 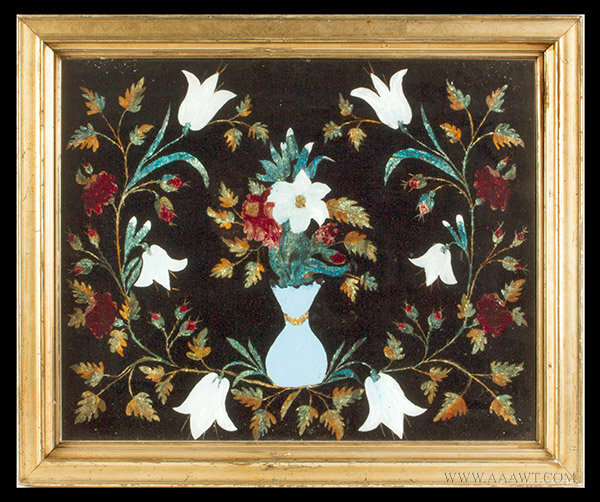 American, 2nd Quarter 19th C.
A simple floral theorem in muted colors. 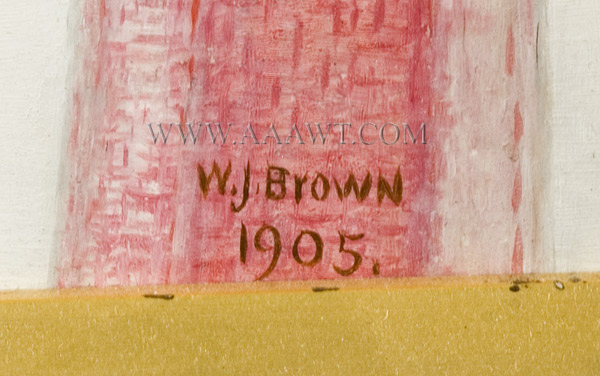 Note: minor stain in the bottom right corner. 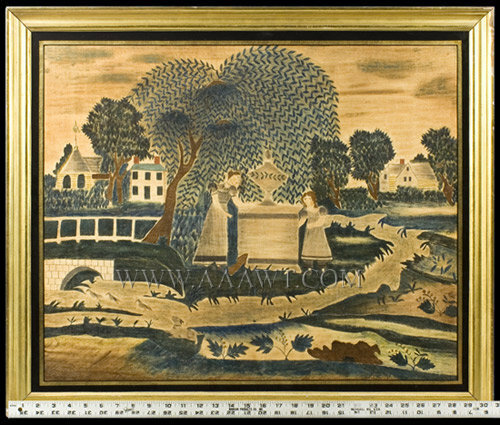 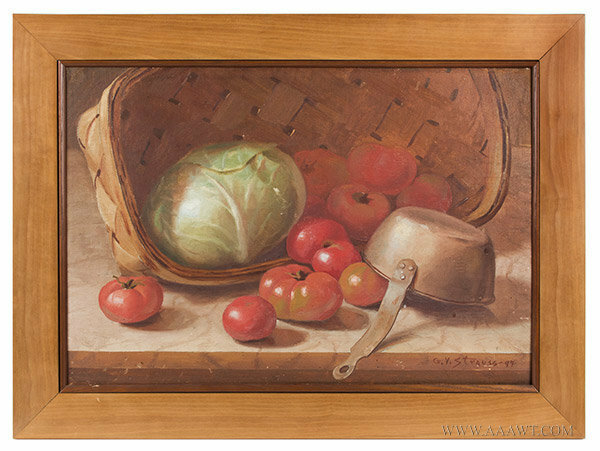 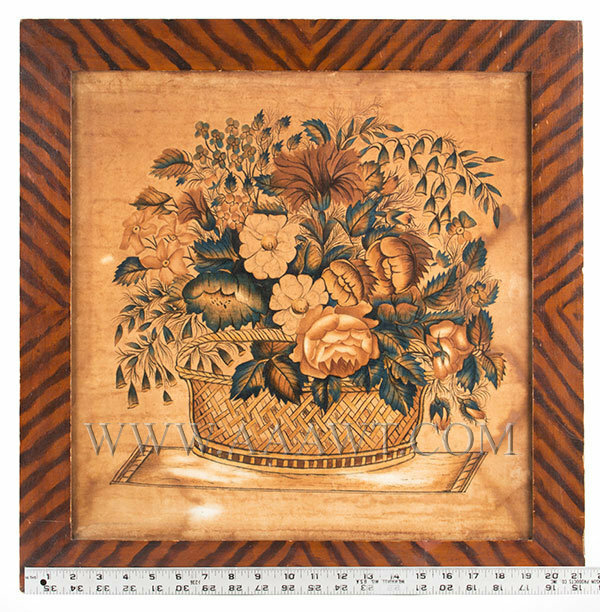 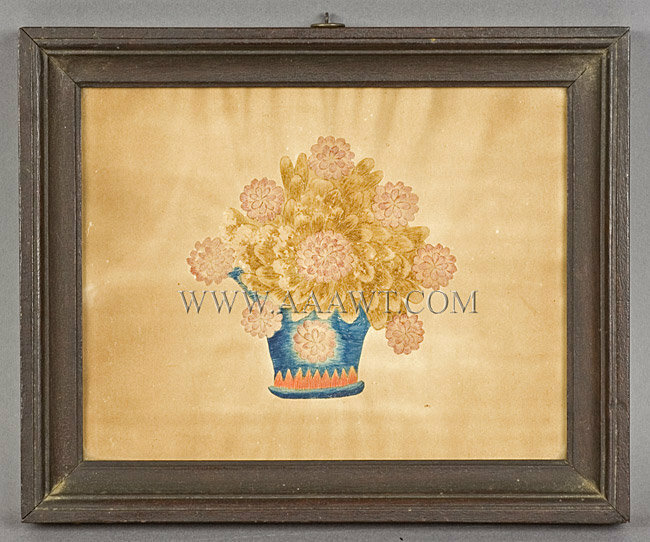 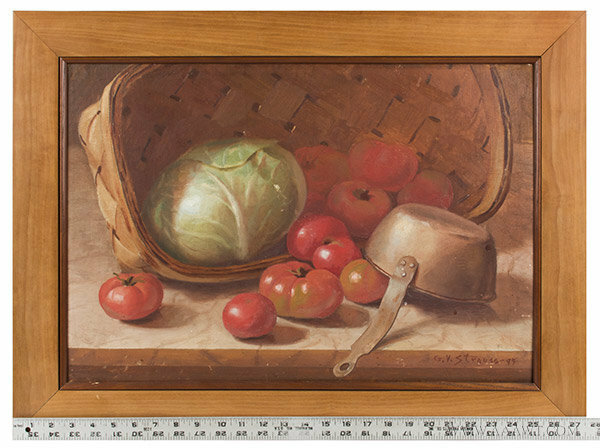 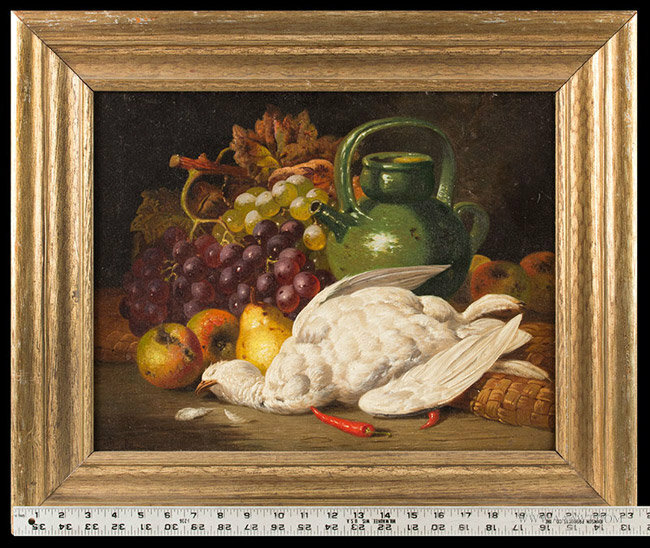 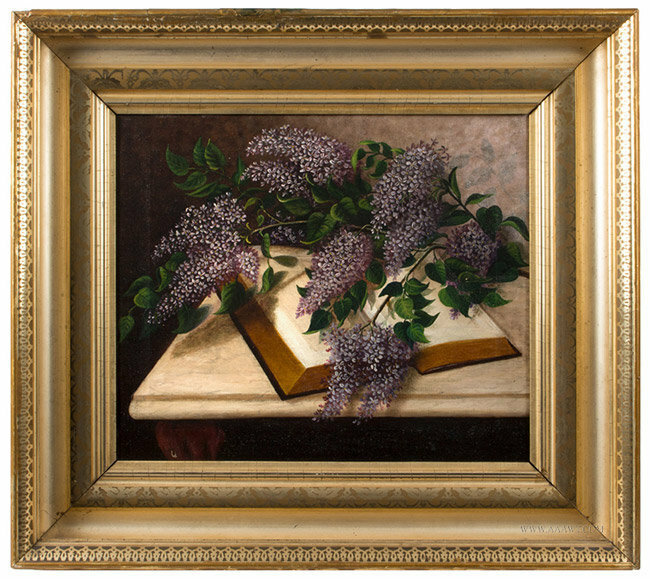 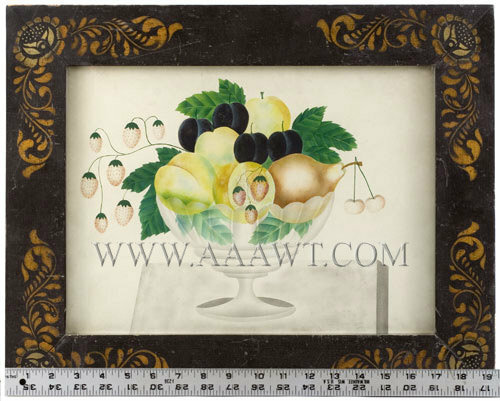 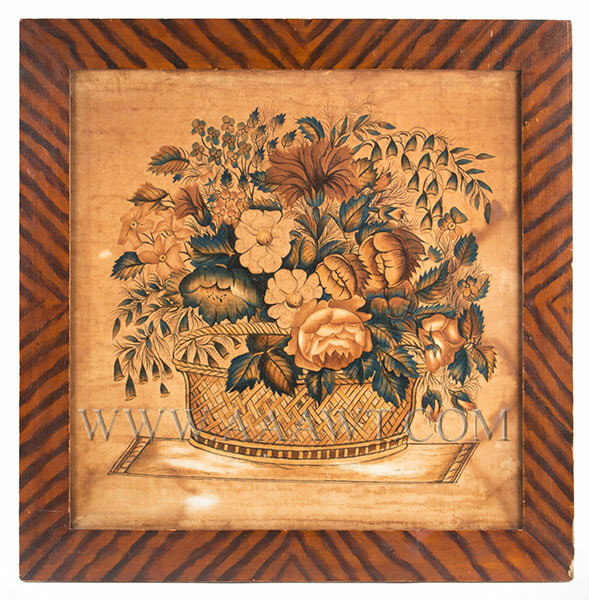 Frame: 16 by 14.5" view: 12.75 by 11.25"
Dimensions: 41.25 by 27.25" frame, 35.75 by 21.75" sight-size. 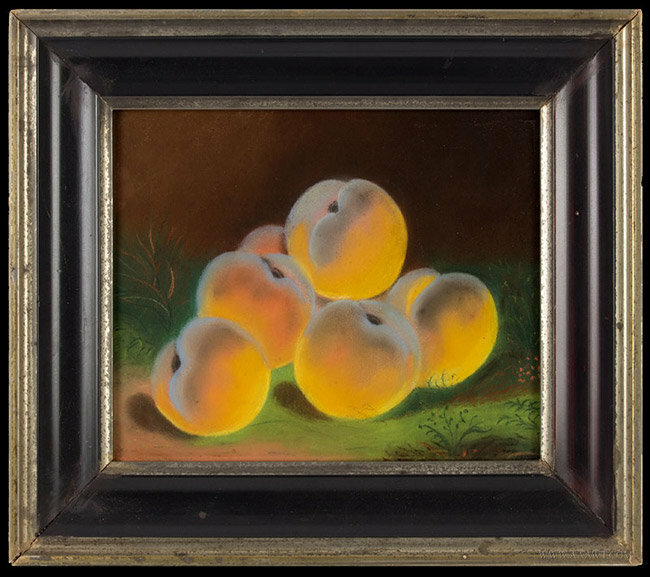 As depicted, basket of peaches set upon grasses and fine wildflowers. 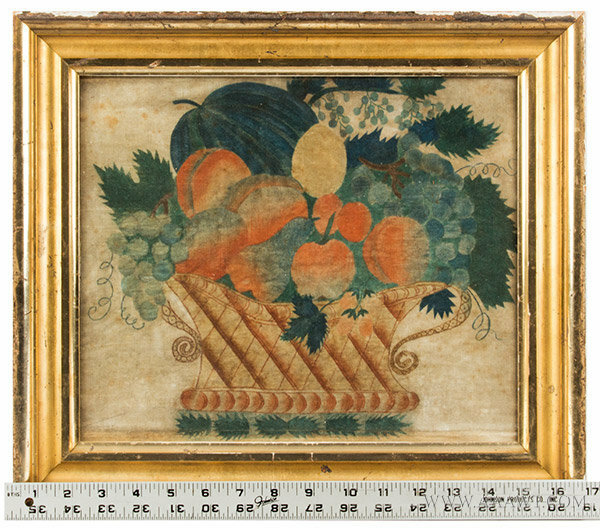 This picture mounted within carved frame and having a pine stretcher should be cleaned, otherwise excellent. 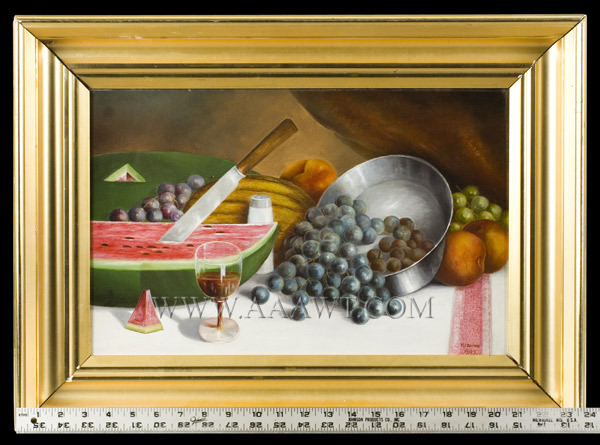 Dimensions: 23.25 by 19.25" frame, 19.5 by 15.5" sight-size. 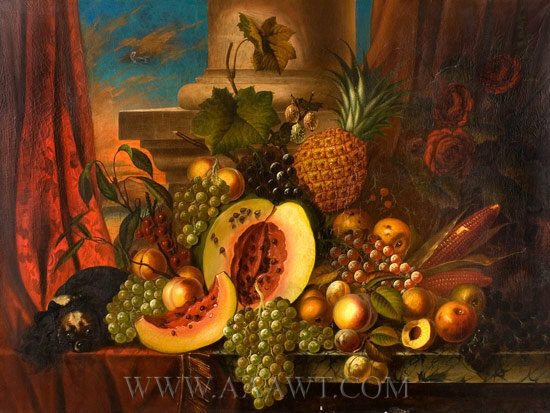 An expressive still life with a wealthy abundance of mature and exotic fruits, vegetables, flowers, and a spaniel, neatly arranged on a marble table centered by drapery opened to a column on plinth before a beautiful blue sky featuring a sunrise palate. 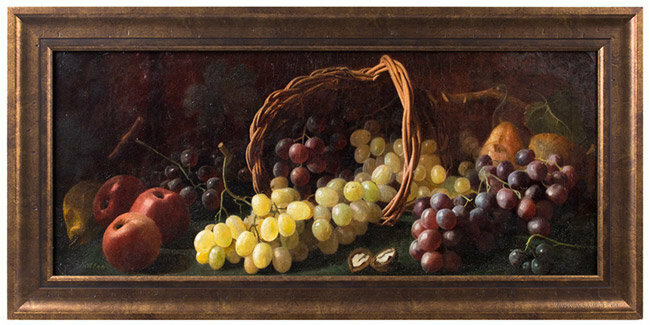 The scale, color, light and contrast are splendid. 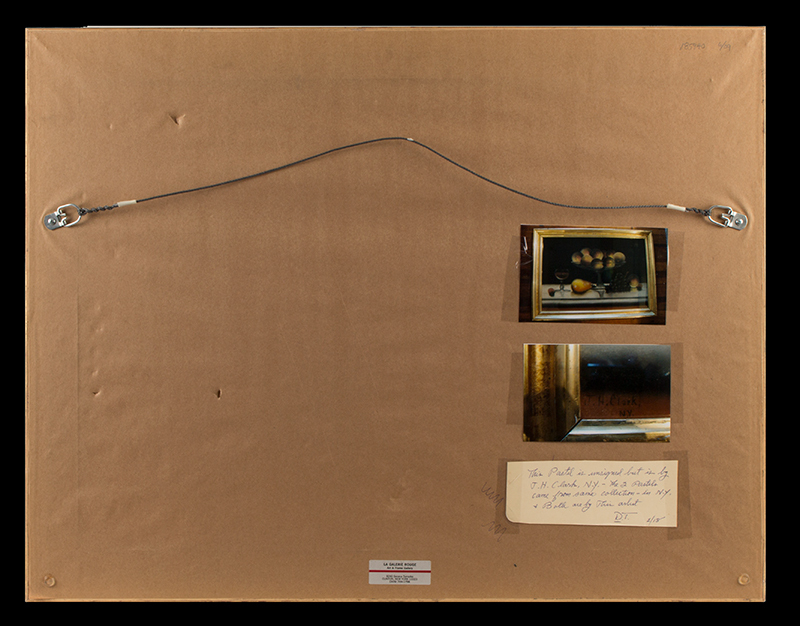 Relined and mounted on strainer, some in-painting and current minor imperfections. 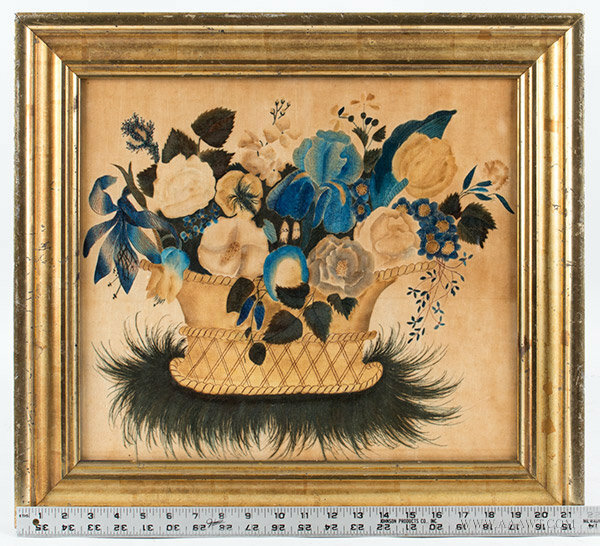 Colorful floral watercolor in very good condition. 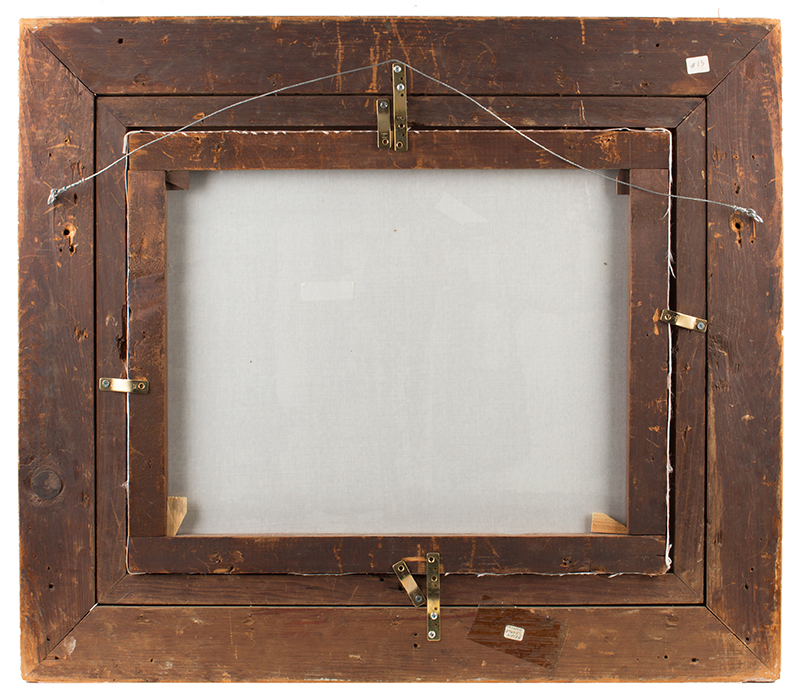 The theorem is framed in a period frame that is possibly original to the piece. 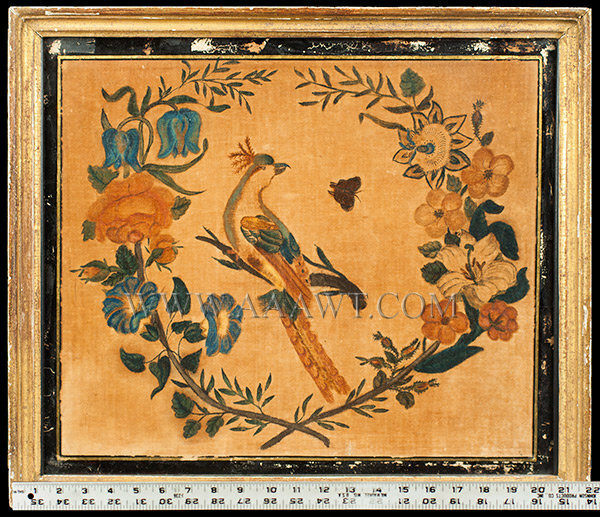 Dimensions: 15 5/8 by 15 5/8" frame, 10 5/8 by 10 5/8" sight-size. 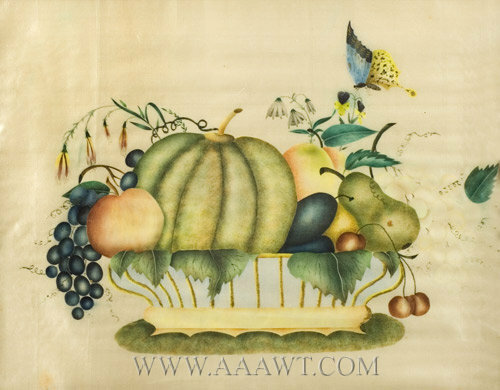 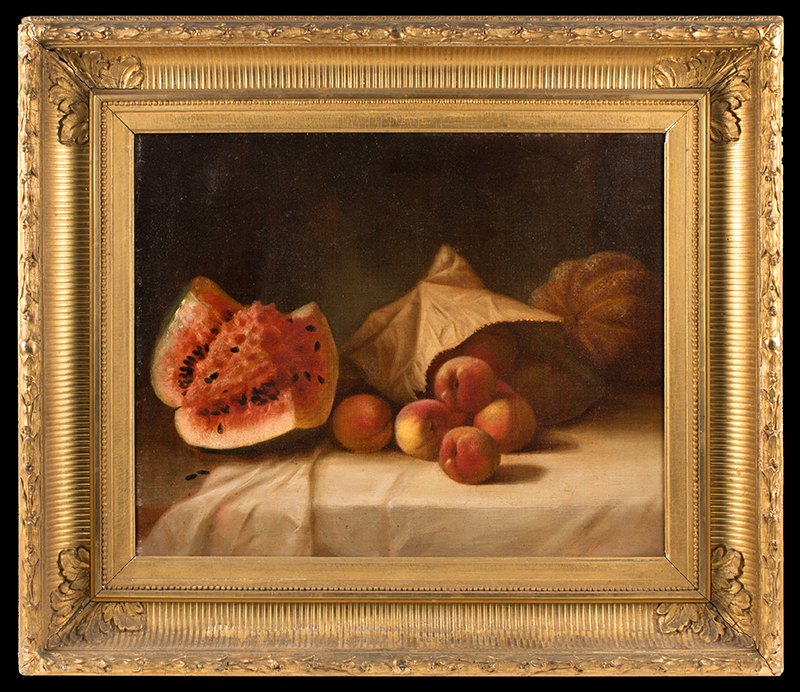 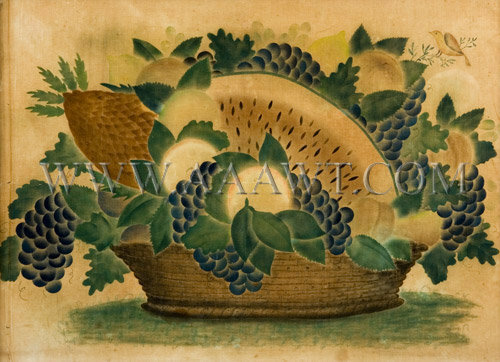 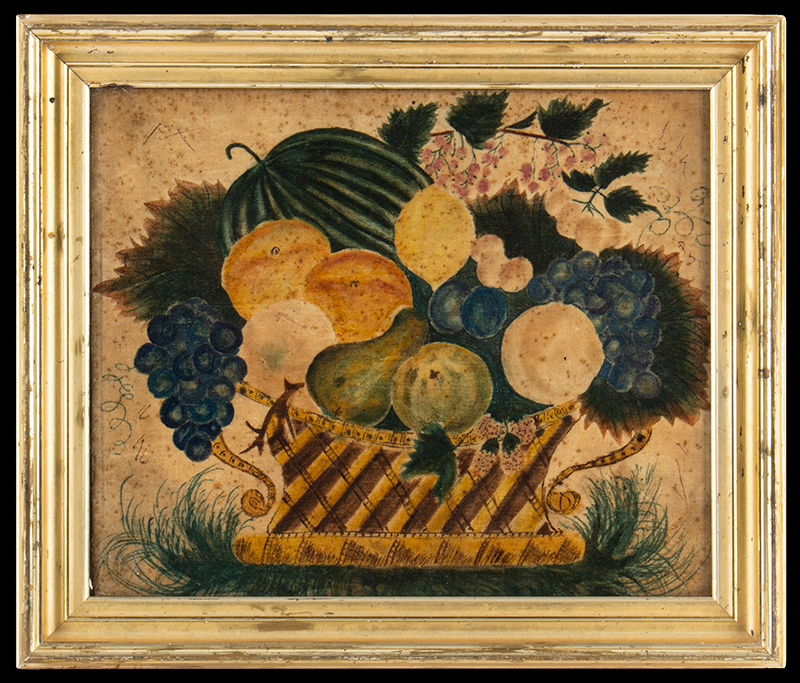 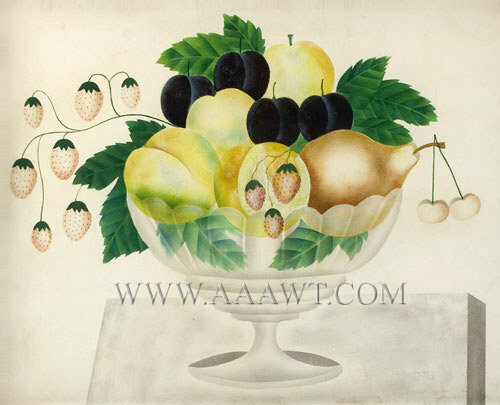 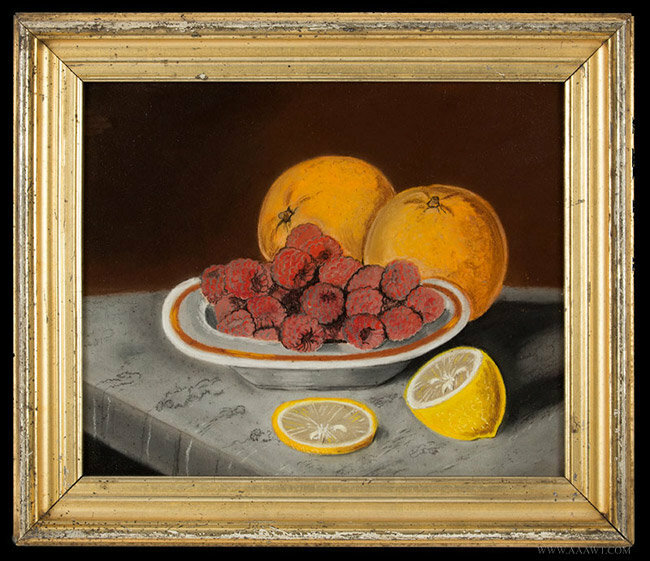 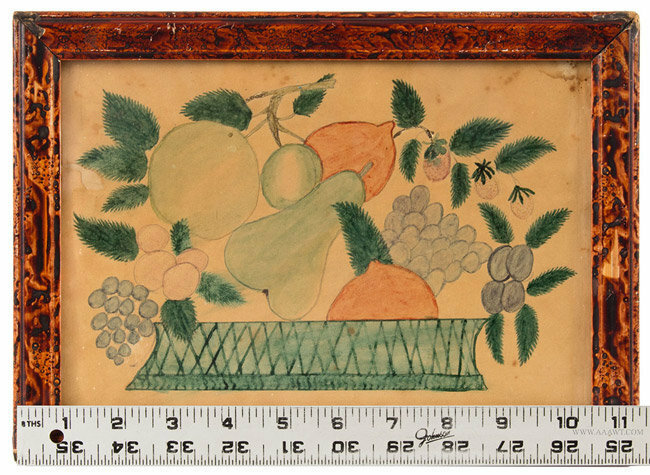 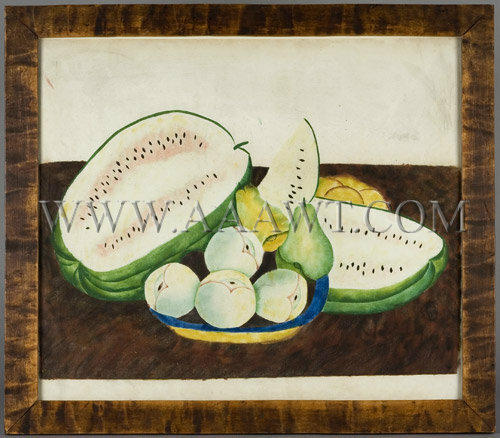 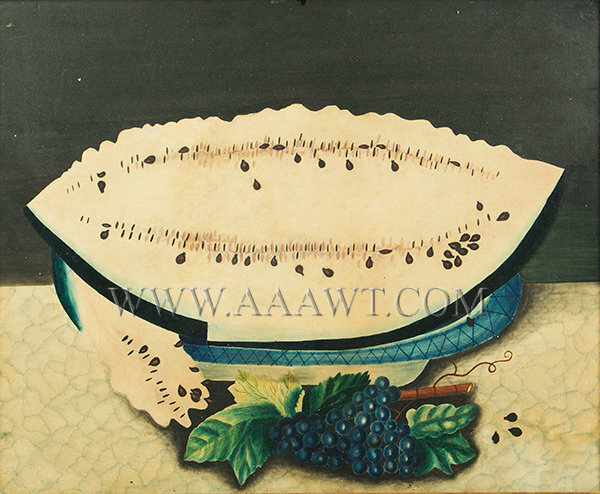 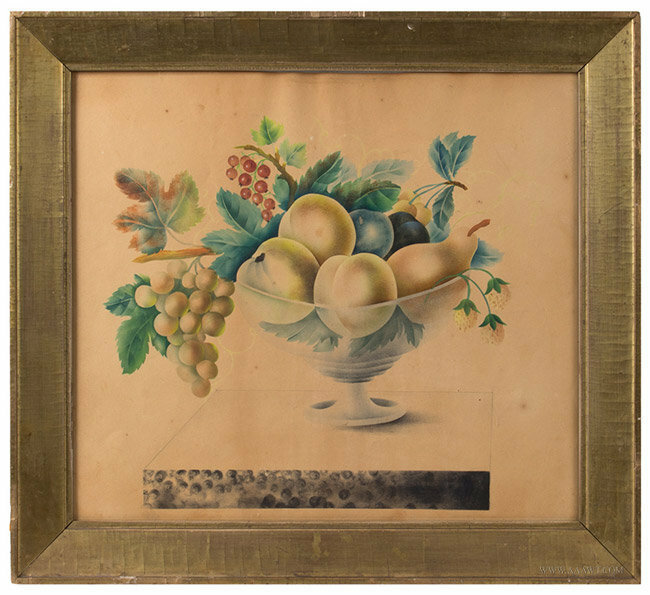 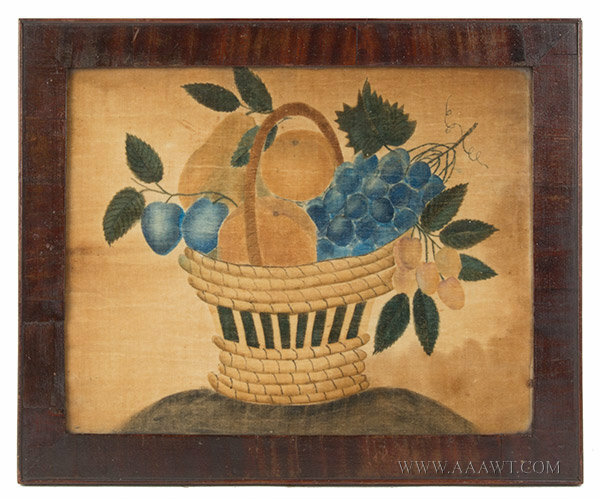 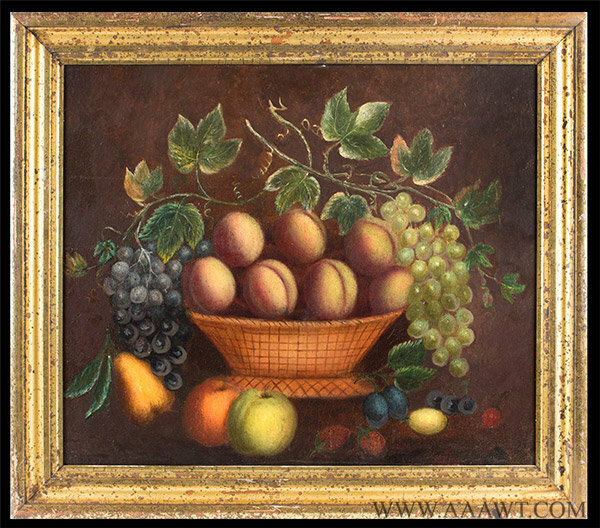 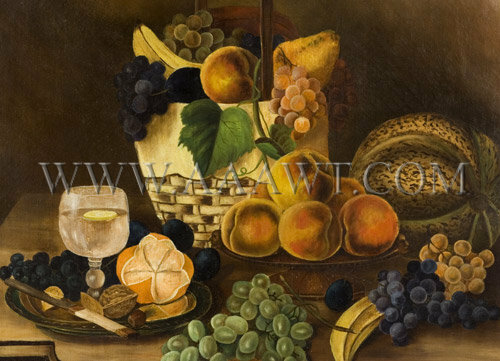 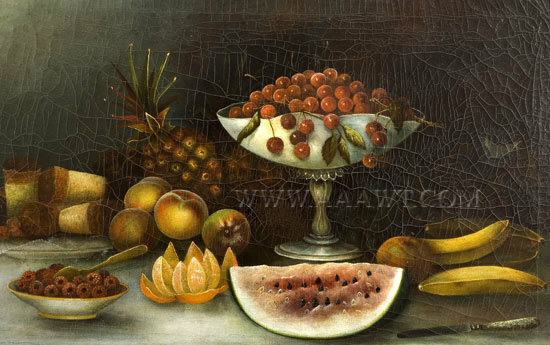 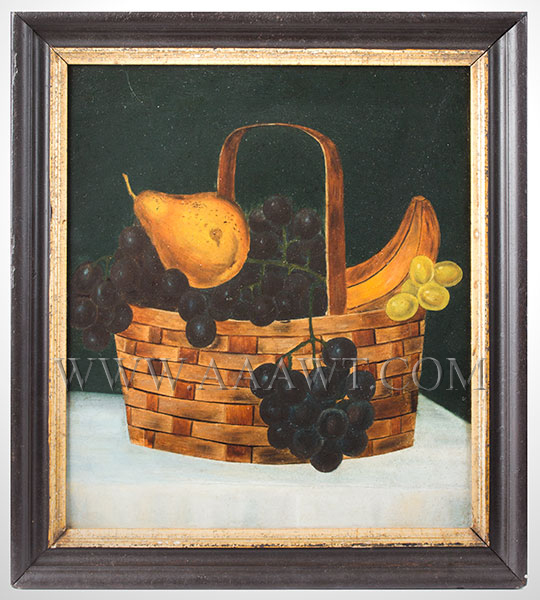 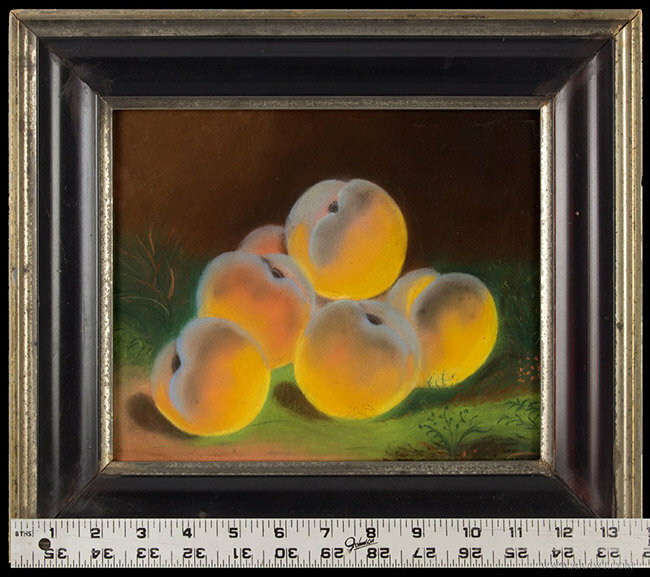 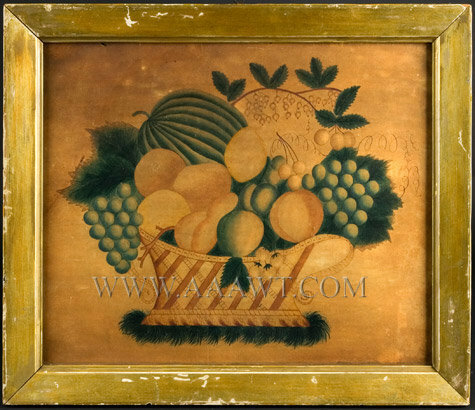 The unidentified artist filled the overflowing wide shallow basket with sliced melon, grapes; pineapple, lemons and other fruits. 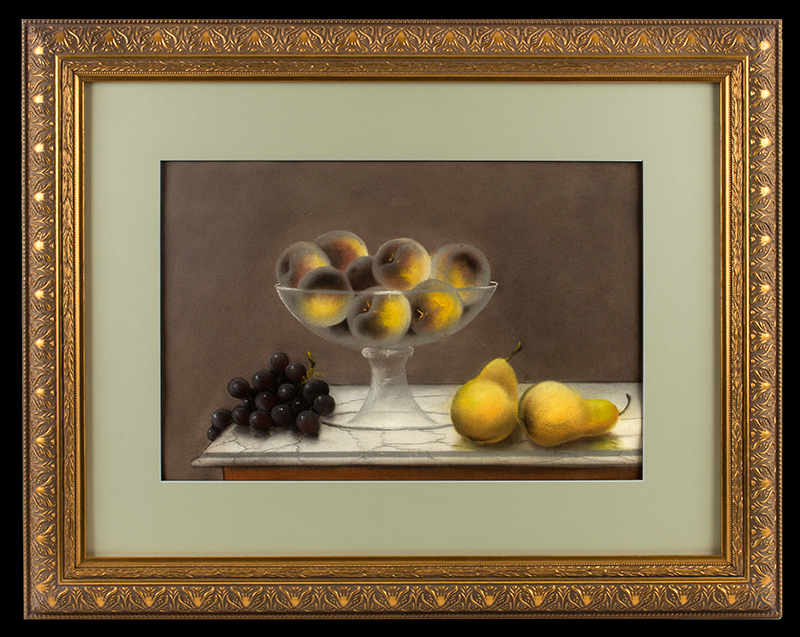 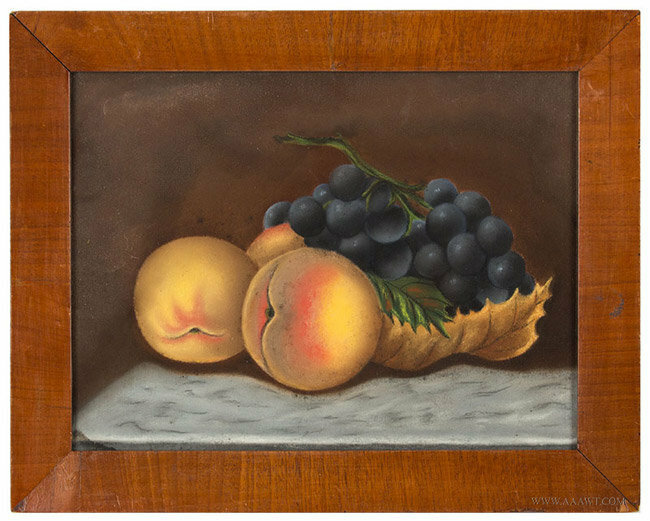 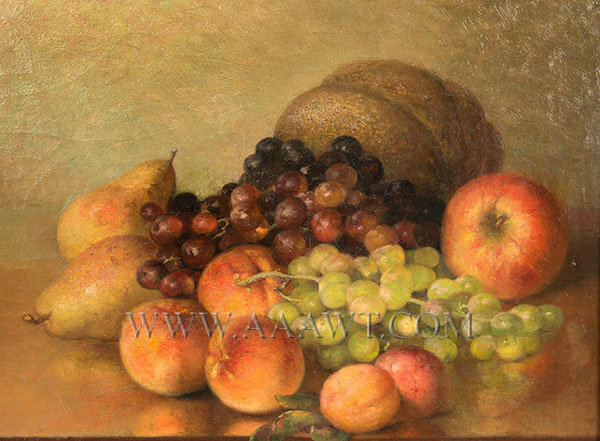 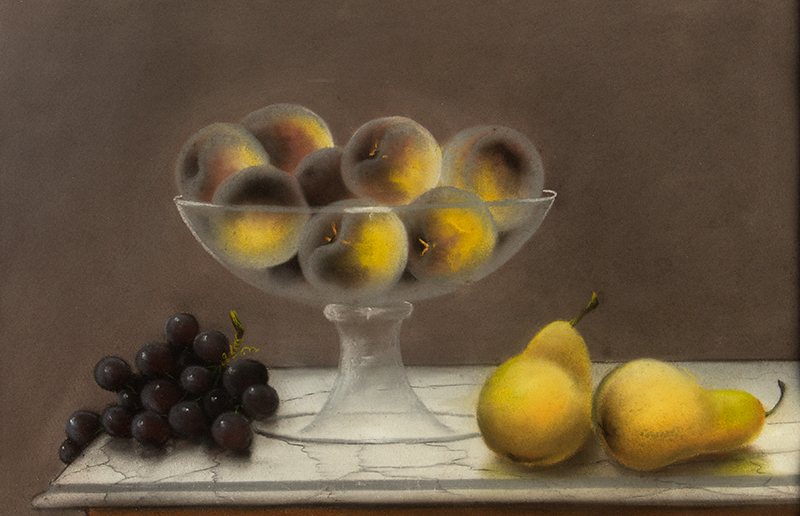 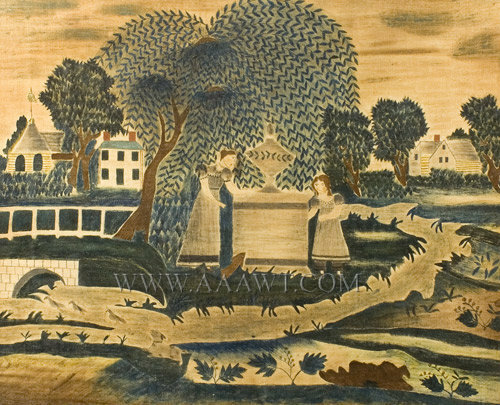 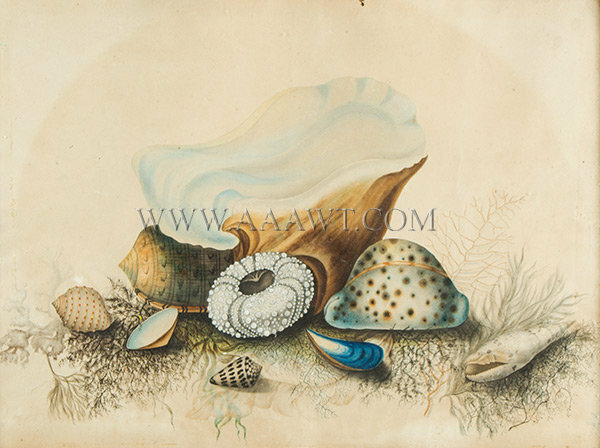 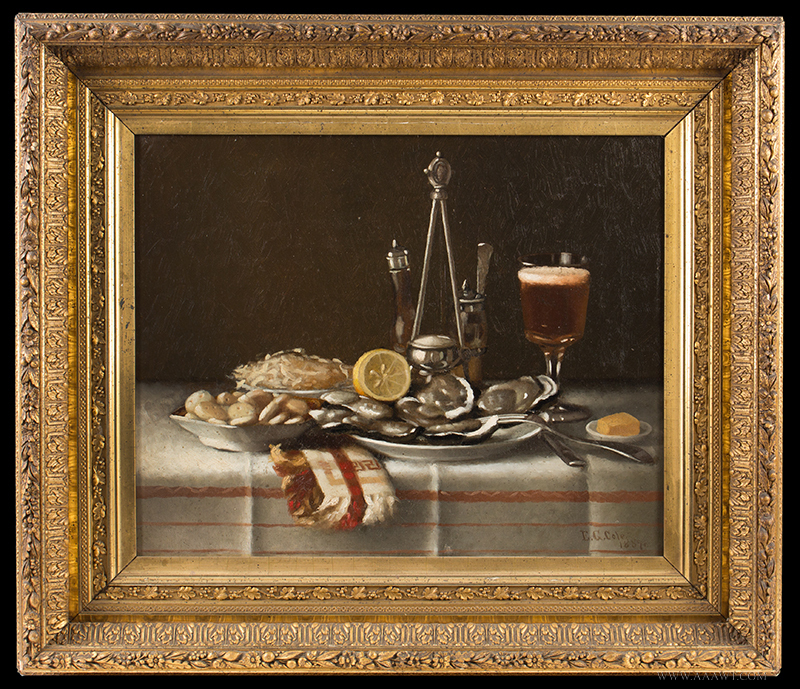 This composition measures 29 by 22.75" overall; view area: 25 by 19". 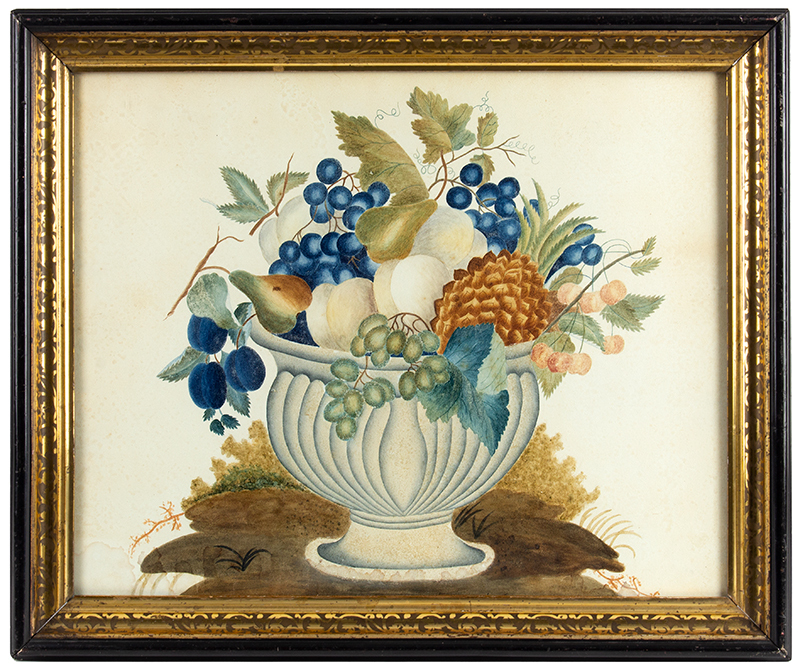 Neatly rendered yet unconstrained compositions featuring fluted blue compote and a basket on grassy green matt, each holding lovely flowers and plant materials. 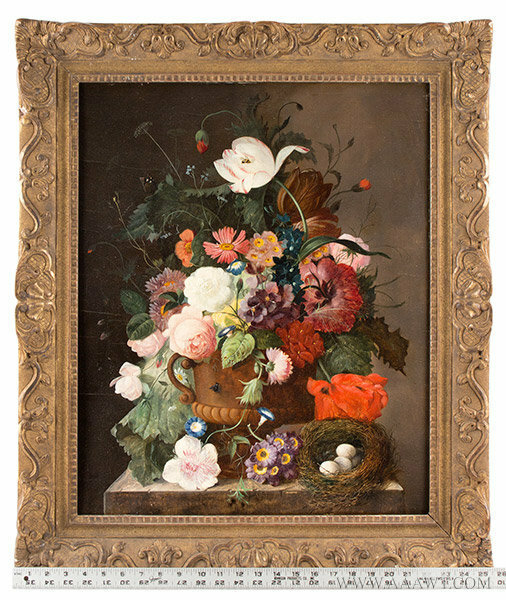 The handling of the work including plant selection, placement of flowers, foliage; detail, and imagery combine to produce a highly individualized, semiformal arrangement. 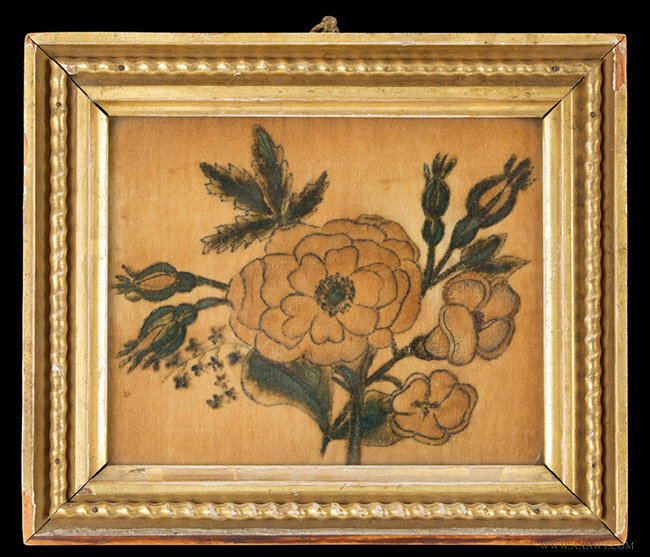 The works are mounted within matching painted frames of the period. 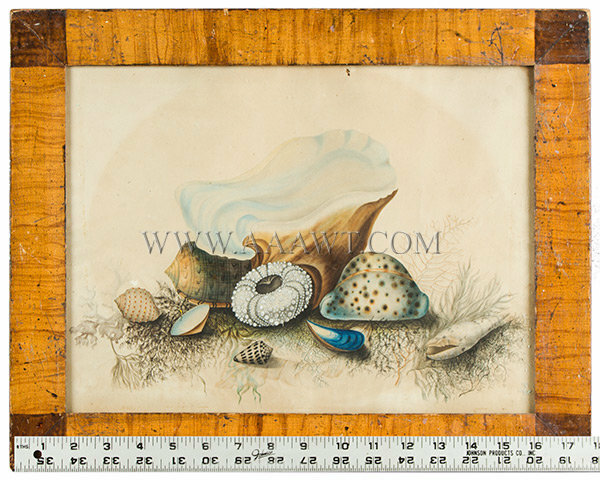 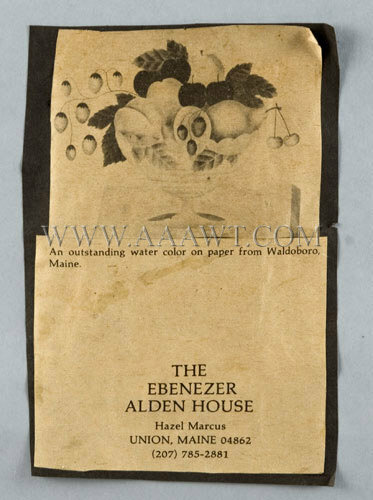 Foxing, toning, and water stains as shown. 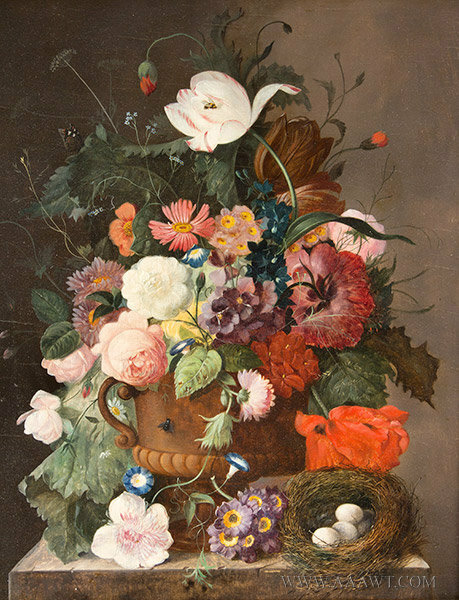 Depicting a variety of fruits, foliage and tendrils arranged within large urn on spreading circular foot. 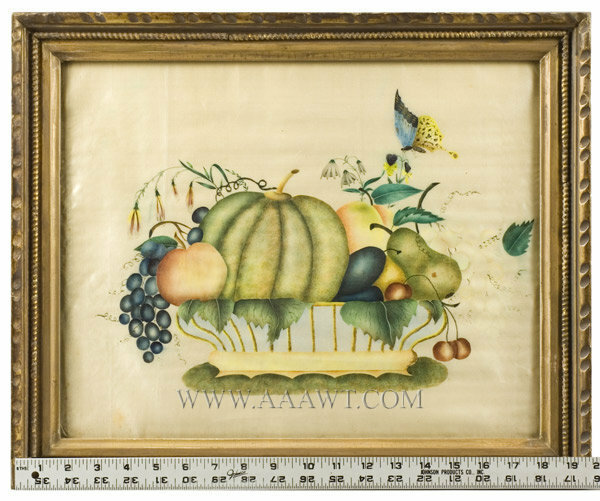 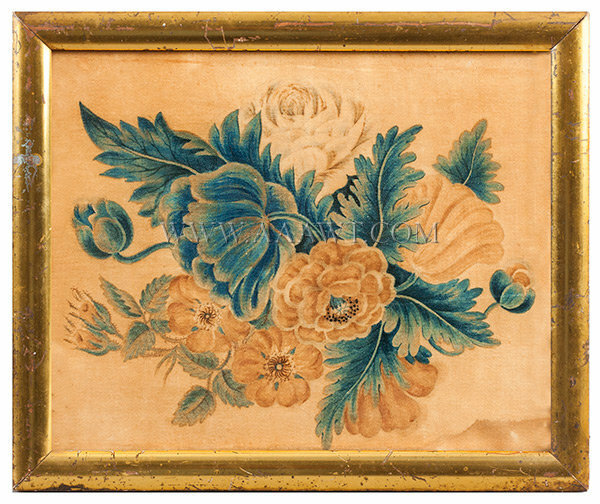 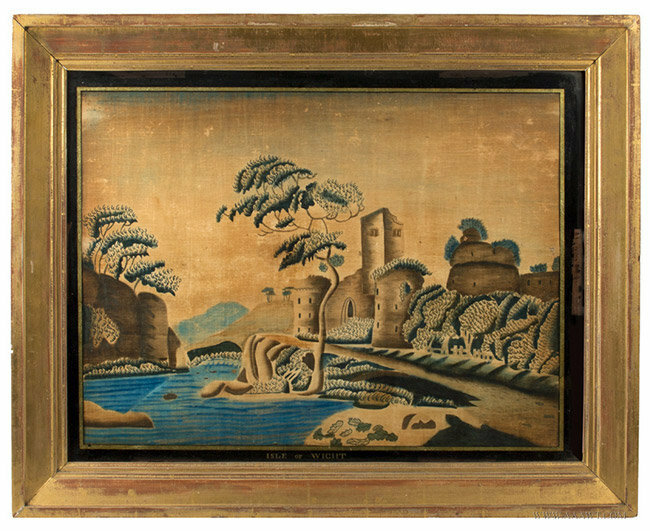 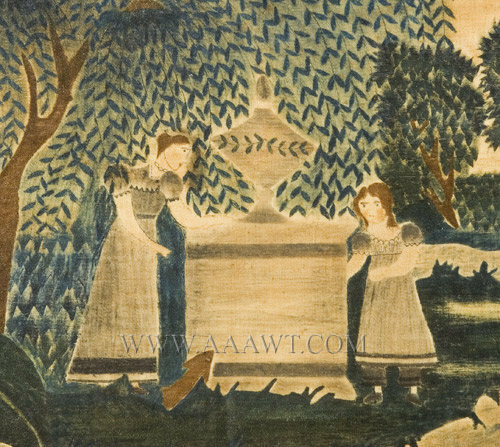 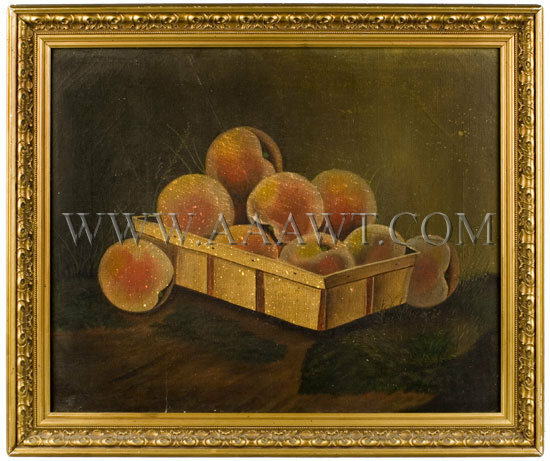 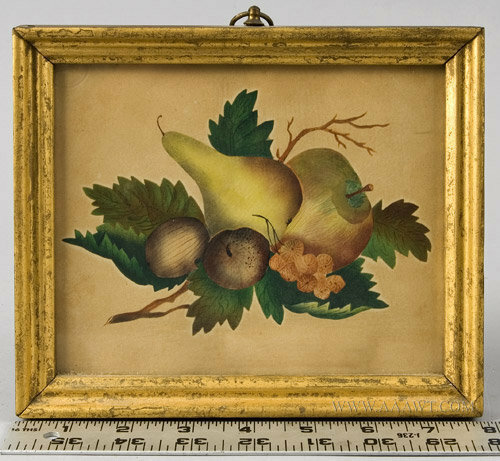 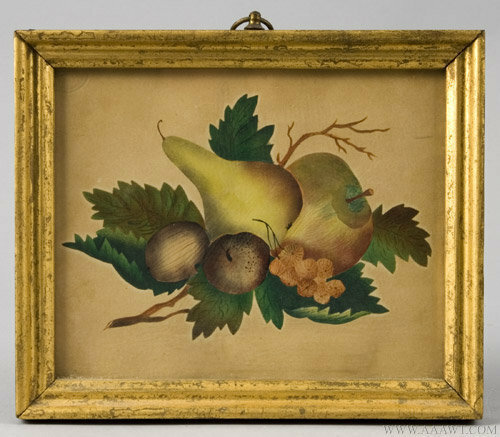 The work is mounted in a period frame with a gold stenciled liner; not examined out of frame…very light/minor foxing and stains, the water stains are limited to the bottom and are barely noticeable.